Whether you are a startup or have been in business for many years, a marketing strategy is essential. Promotion is just as necessary for B2B (business to business) as it is for B2C (business to consumer). If you’re struggling to spread the word about your business or simply want to streamline your B2B marketing operations, this guide will help you achieve your goals and lay out a marketing strategy for your organization. 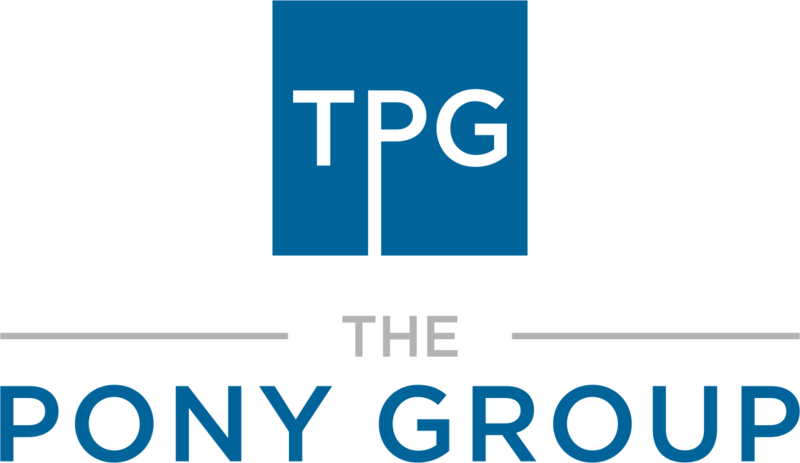 As a fractional CMO, marketing consultant, and business advisory firm based in Austin, a B2B marketing strategy is one of the most common projects we help businesses solve at The Pony Group. This guide will help you get started as a new business, help pick up the pieces and make sense of your marketing if you’ve been throwing stuff at the wall, or assist an established business re-imagine their marketing strategy. Is there a space in the market for our product/service? Which businesses are realistic competitors, and which are reaching out to a different target market? What is our present market share and is it possible to improve it? Which strategies are your competitors presently using? Which strategies have your competitors used in the past? 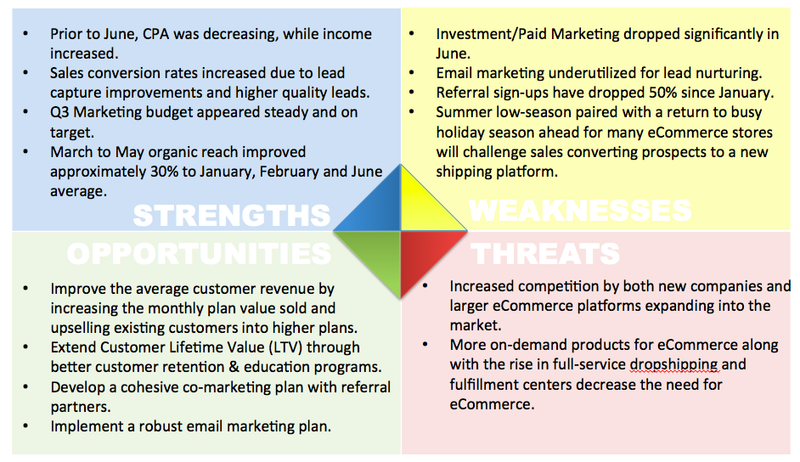 A sample SWOT analysis for a B2B eCommerce Company. 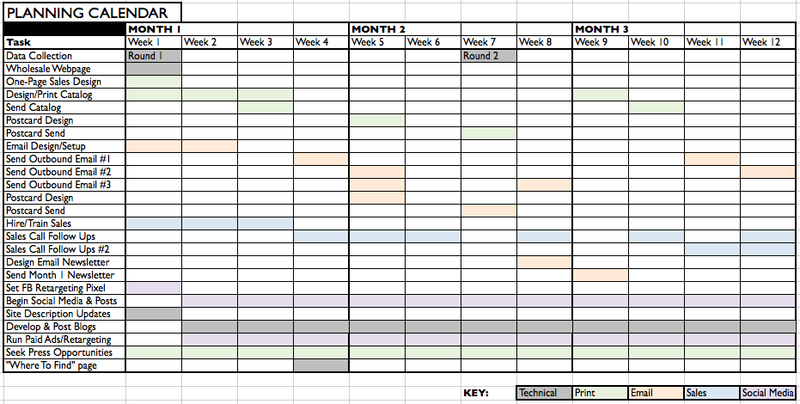 One of the simplest ways to conduct a competitive analysis is to set out a grid. List your competitor products or services on the left and a list of main common features along the top. Put a check mark against each product/service. Identifying key features of their and your products will help in driving your marketing campaign. Another common type of grid is to use a SWOT analysis, which stands for Strengths, Weaknesses, Opportunities, Threats. Below is a list of essential methods to apply in the course of your marketing strategy. Not all will apply to your industry or even your business. Some methods may be out of your budget, so try to use the right affordable combinations and plan for different stages of growth and what strategies to implement at certain times. 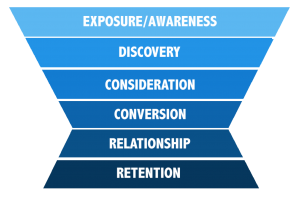 Prospecting is the first step in lead generation and building your marketing funnel. Essentially, it is building a list of potential customers. This is not an easy process as it’s not always straightforward to predict, but marketing professionals use prospecting to improve both quality and quantity of customer leads. The simplest method is to compile a list and calculate the most to least likely prospects. Inbound marketing is a natural progression of the web as a business tool. You are effectively leaving a trail of breadcrumbs to lead prospects towards your marketing or sales material, website or other resource. They may take the form of special offers with a call to action, promotional video content, free downloads or relevant content on social media. This is the opposite of inbound leads. 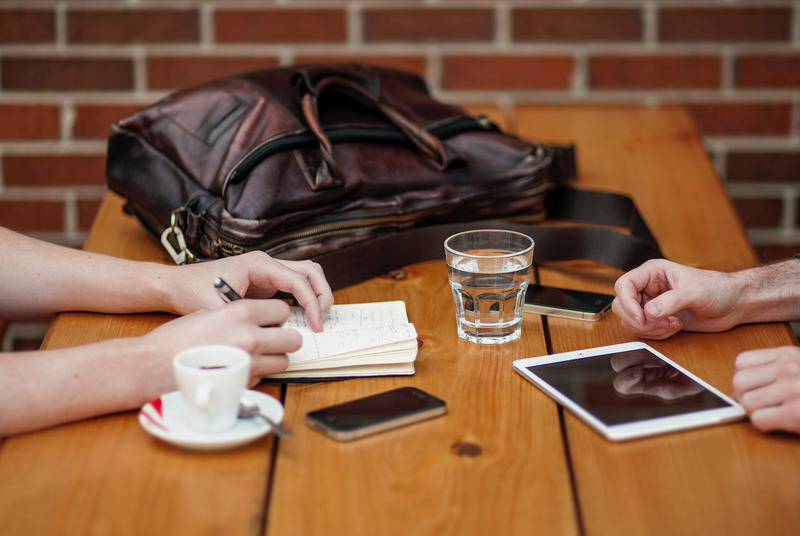 Instead of leading clients through encouragement, you’ll contact them directly. Typically, this involved sales emails, phone calls and other direct methods of potential customer engagement. It’s time intensive and some businesses feel it is no longer useful. In its favor, it sometimes creates a personal touch that some B2B customers prefer. Lead generation is arguably the most important method of customer outreach, even in a B2B marketing strategy. Here are the most common channels presently in use. Few lead generation methods are more important than web content and effective SEO planning. Build an audience by providing valuable and relevant content to your audience and in line with your brand’s voice. For an effective SEO strategy, it’s strongly advisable to research the most effective keywords with software such as SEMrush, to examine relevant content with Buzzsumo and harness Adwords. For a B2B marketing strategy, this can often be a channel that produces great results by positioning your thought leadership in search results without having to pay for ads, then result in your content also being referenced for other articles. If you are looking for more information on this topic, check out our post on content and SEO. We also have a great checklist for SEO as well. Social media is good for visibility and SEO, and provides customers with a choice on how to engage with you; it’s just as relevant for B2B as B2C. Typically, you should have a Facebook and Twitter page, but you should also consider LinkedIn, an official YouTube channel, Vimeo and Instagram too. These latter platforms are visual based, essential if your product or service is visual in nature. It is important to use a calendar planning tool to maintain a consistent flow of content, planning your social media voice, and also ensure an understanding of who is responsible for which aspects of your social media. 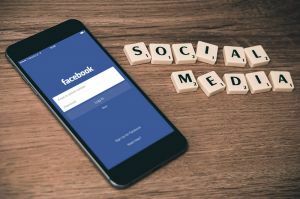 Marketing may run your social channels by actively posting, yet sales may have a responsibility for some aspects from inbound leads, or customer support may step in for any replies and messages. Email marketing typically provides the highest return on investment in a B2B marketing strategy. Many businesses no longer prefer outbound lead marketing, but email marketing remains popular and successful given the right application. B2B and B2C organizations use email newsletters for similar reasons. It’s used to keep existing customers up to date on offers, new products and services, but it’s also useful for understanding business performance. By using the right messaging at the right time, you can not only nurture leads to become possible customers through things like thought leadership, or entice them with special offers, but you can also build a rapport so when someone is ready to consider your services, you are in the right place at the right time. With supplied data, it’s possible to compile a profile of a typical customer, and those unlikely to require your products or services based on click through information, email open rates and other information an email service provider like Mailchimp provides in their reporting. Want to know more? we did a deep dive into how to build an email marketing strategy. Like what you’re seeing? Subscribe to our mailing list for more marketing tips. Businesses in all industries with a social media presence spent more on paid media in 2016 than in 2015. This trend is set to continue through 2017 with Instagram reporting exponential growth for business use. Paid media such as targeted advertising through social media allows you to direct your advertisements at specific target audiences, acting as a more intelligent form of outbound lead generation. When considering channels to include in your B2B marketing strategy, this can often be the most expensive, sometimes produce slower results for a B2B business, yet when done correctly, it can bear the most fruit when tracked properly for attribution. Direct mail, brochures, pamphlets, local newspapers, radio and even television are still effective methods to use in your B2B marketing strategy. For some industries, they may even be the best types of customer outreach. Businesses in some industries use sites such as Periscope to broadcast live video, inviting live interaction. Facebook recently added a live video function; this is fast becoming a modern version of the webinar to share thought leadership. LinkedIn is also currently rolling out their live video as well. Keeping your eye out for PR and press opportunities is a worthwhile endeavor both through your local relationships, as well as national resources like Help A Reporter Out. We share more reasons why PR can be your company’s best friend and the resources in our most popular posts: getting started with PR guide . Our founder has also written posts about tools for direct mail campaigns and how to make your first direct mail campaign successful. Now that you have designed your strategy, it’s time to plan how you’re going to organize your marketing outreach. Decide on your goal: what do you hope to achieve from your marketing program. Is it to establish your position in the market, increase profit margin, or reach out to an untapped demographic? At the end of each target cycle, examine the success or otherwise of each marketing tactic. Which produced the best results? Which produced the worst results? You’ll find a range of marketing, organization and planning tools available. You may have heard of such powerhouses as Salesforce and NetSuite. These packages are modular, which means you may choose individual software applications to buy as a Software as a Service (SaaS). There is also Marketo, a marketing management package that helps high-growth companies automate many aspects of their marketing strategy. Then there are the smaller more streamlined packages and tools such as WhoIsVisiting, a website analytics packaging that delivers data on the profile of your typical website visitor. This is ideal if you wish to identify your core market by monitoring your visitors in order to devise a marketing strategy. The biggest name in inbound marketing and web content is HubSpot. They also are one of our favorites to stand behind and recommend. No matter the size of your business, it has everything to allow you to automate your marketing, provides templates, and helps you build personalized tools for email campaigns. It’s also a great resource for website building, analytics, and provides regular content to improve your content marketing. If you’re looking for a few of our favorite recommendations, we’ve put together a marketing tools & resources guide. Having a marketing plan requires targets and deadlines by which to achieve them. Once you have identified what you want to achieve and how you will go about achieving it, it’s time to break down the strategy into a series of small and achievable goals. Sample sales & marketing planning calendar. Here, we’ve provided the tools and methods that should help you build a marketing strategy to grow your business. It’s important to continually research the demands of your audience and the changing trends of B2B marketing. Use the right analytics in the right way and you’re almost guaranteed a successful campaign.